The 2017 draft was the first time the New York Rangers selected in the first round since 2012; and more than ten years since they had two first round selections. Overall the Rangers had a positive draft with two potential impact players selected early on in Andersson and Chytil. In the later round the Rangers selected several overage players which will help stock the minor pro cupboards sooner rather than later. 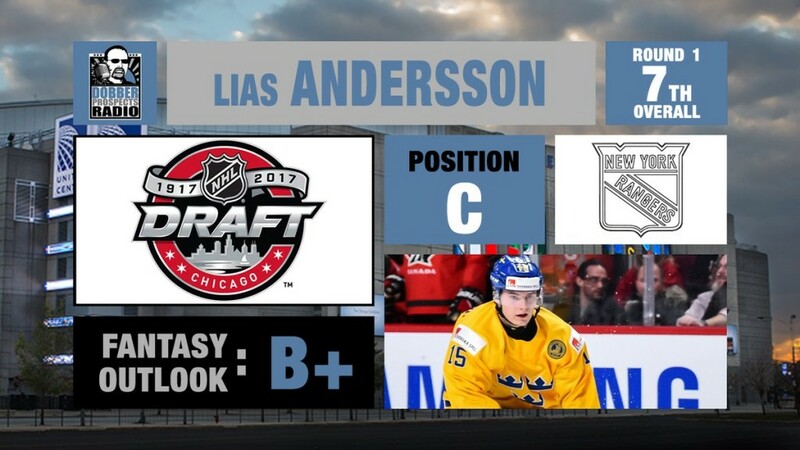 Andersson entered the draft with a mid first round projection and jumped into the top-10 when the Rangers selected him 7th overall. There is a lot to like about Andersson’s game and the fact it has matured in Sweden’s top league the last 1.5 seasons. Andersson produced 9 goals and 10 assists in 42 games in 2016-17 playing for HV71 in the SHL where his team went on to win the league championship. Impressively he also finished the season +21 which placed him top-10 league wide. Internationally Lias was even stronger chipping in 15 points in 17 games at the U20 level. Overall Lias is projected to be a top six forward with top line potential and may prove to be even more valuable in multi category fantasy league’s due to the strength of his all around game. 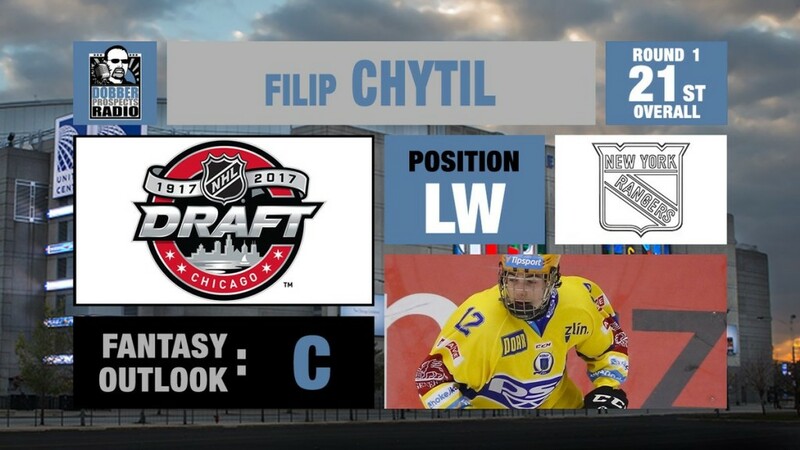 Chytil is viewed by many as an off the board pick this early in the first round however he does possess the rare combination of skill, speed and size (6’2” 196 lbs) that all teams covet down the middle. Chytil was also only a few days from being part of the 2018 draft so he’s one of the youngest players selected in 2017. Combine his age with the fact he’s playing against men in the Czech Republic’s top league and you won’t be blown away with his 4 goals and 4 assists in 38 games. 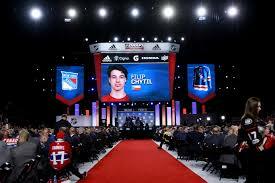 Chytil is known to be a strong and smooth skater which will transition well to the next level. The North Bay Battalion of the OHL Chytil’s CHL rights so there is a possibility he will be skating in North America sooner rather than later. Crawley was selected as a 20 year old by the Rangers after being passed over in the last couple of drafts. Playing in London of the OHL Crawley was a key contributor on the blue line the last few seasons amassing 16 goals and 45 assists in 187 career regular season games. In addition he has played another 40+ playoff games including a Memorial Cup championship. Crawley possesses NHL ready size (6’1” 205lbs) and plays more of a stay at home defensive style. Sjalin is one of the youngest players drafted and won’t turn 18 till September 2nd 2018. After missing the entire 2015-16 season with back issues, Sjalin suited up for Ostersunds IK in Sweden’s 3rd division in 2016-17 where he posted 5 goals and 10 assists in 34 games. In addition, Calle played ~20 games for the Swedish U18 club in both the WJC-18 and other international competition. Expect him to remain in Sweden and jump up a division in 2017-18. Lakatos has a reputation of being a pest and difficult to play against. In 2017-18 he put up modest numbers of 10 goals and 12 assists in 41 games with Liberic Bili Tygri in the Czech Republic top league. He stepped up production in the playoff with 13 points in 16 games as his team went on to win the championship. Overall Lakatos will need to improve his skating to make a seamless transition to North American pro hockey if he decides to come venture across the pond. Barron brings size to the table (6’3” 209 lbs) and plays a two way game down the middle. Ranked in the top 100 North American skaters by Central Scouting, Barron has played Canadian high school hockey the last two seasons for St Andrews College. While his offensive production has been solid with 68 goals and 54 assists in 104 career high school games, it is difficult to find meaningful comparisons. Barron has committed to attend Cornell in the fall of 2018 where he will be suiting up for the Big Red. His CHL rights are owned by the Saint John Sea Dogs of the QMJHL. The 21 year old Virta parlayed a solid season with TPS of Finland’s Liiga into a late round draft pick with the Rangers. The diminutive forward (5’9, 180 lbs) finished the 2017-18 campaign with a respectable 14 goals and 12 assists in 49 games, a significant jump from a season earlier where he totalled 4 points in 33 games. Virta is teammate of Rangers draft pick Tarmo Reunanen and recent free agent signing Aleksander Georgiev so rest assured the Rangers did their homework. Forwards Jimmy Vesey, Matt Puempel and Pavel Buchnevich and defenceman Brady Skjei spent significant time with the big club in 2016-17. Many Rangers prospects whom have yet to see extended NHL time had notable contributions in their 2016-17 campaigns. Anthony DeAngelo was acquired by the Rangers in an offseason trade with the Phoenix Coyotes. The smooth skating DeAngelo split his time between Phoenix and Tucson (AHL) last year in his second pro season. DeAngelo contributed 5 goals and 9 assists in 39 games in Phoenix and added another 3 goals and 13 assists in 25 minor league games. Expect DeAngelo to challenge for a roster spot in NY this fall. A Memorial Cup championship was a suiting way for Sean Day to potentially end his OHL career. The exceptional blue liner was a solid early season addition to an already deep Spitfires team and contributed 12 goals and 20 assists in 58 games. Most impressive however was Days commitment to playing a solid two way game. Day has once again been invited to the US WJC camp and is eligible to play in the AHL for Hartford this coming 2017-18 season. Ryan Gropp wrapped up his WHL career this past spring amassing a total of 132 goals and 162 assists in 300 regular season and playoff games. Expect the talented winger to land in Hartford to start the 2017-18 season. After advancing to the NCAA championship game this past spring and being selected as a 3rd team All American, Neal Pionk signed with the Rangers in May 2017. Pionk has excelled at every level he’s played at and he’ll be eyeing up a roster spot with the Rangers coming out of training camp. Realistically he’ll start the season in Hartford with the Wolfpack. Adam Tambellini has a decent campaign this past season in Hartford amassing 13 goals and 22 assists in 68 games for the last place Wolfpack. Growing up in pro rinks along side his father and going into his 3rd pro season, Tambellini will need to elevate his game in order to break through with the Rangers this season. Igor Shestyorkin had a lights out 2017-18 season in the KHL where he posted a 1.64 GAA and 0.937 save % for SKA St Petersburg, while also winning the Gagarin Cup during his first full pro season. Shestyorkin doesn’t fit the mould of the modern goalie at 6’1” however he relies on his extraordinary reflexes and skill set similar to New York’s Mr Lundquist. Contractually Shestyorkin is locked up by SKA through 2018-19 so unless the Rangers exercise a buyout don’t expect to see him in North America in the near future. Adding to the Rangers riches in net, Brandon Halverson split time between Greenville and Hartford in 2017-18 while posting a 3.45 GAA and 0.887 save % in 26 AHL contests. With Magnus Hellberg signing in the KHL this spring, Halverson will be in a full on battle for the #1 role with newcomers Aleksander Georgiev and Chris Nell. Georgiev is a recent free agent signing following an excellent development camp in June 2017 under the watchful eye of goalie coach Benoit Allaire. Georgiev played the 2017-18 season within TPS of Finland’s Liiga where he posted a 1.70 GAA and 0.923 save % through 27 games. Nell signed on with the Rangers at the end of his college season and saw action in four games for the Wolfpack. Lost F Nicklas Jensen to Jokerit of the KHL however NYR retains his rights as they did present a qualifying offer. G Magnus Hellberg joined the Kunlun Redstar of the KHL. Lost free agents including Marek Hriivk (CGY), Brian Gibbons (NJD), Chris Summers (PIT), Adam Clendening (ARI), and Magnus Hellberg (KHL). Signed undrafted free agents including Aleksander Georgiev (G), Dawson Leedahl (RW), Neal Pionk (D) and Alexei Bereglazov (D). Did not extend a qualifying offer to Brandon Pirri, Adam Clendening, Mackenzie Skapski, Troy Donnay and Michael Paliotta. Goalies (4): Aleksander Georgiev, Adam Huska, Chris Nell, and Tyler Wall. Defensemen (13): Alexi Bereglazov, Brandon Crawley, Sean Day, John Gilmour, Brenden Kotyk, Giffin Luce, Alec McCrea, Tyler Mueller, Vince Pedrie, Neal Pionk, Tarmo Reunanen, Calle Sjalin and Sergey Zborovsky. Forwards (21): Lias Andersson (C), Morgan Barron (C), Adrian Carbonara (RW), Filip Chytil (C), Colton Conrad (C), Walker Duehr (RW), Gabriel Fontaine (C), Tim Gettinger (LW), Ryan Gropp (LW), Domink Lakatos (C), Dawson Leedahl (LW), Vinni Lettieri (C), Ryan Moore (C), Andrew Oglevie (C), Kyle Pettit (C), Pavel Poryadin (RW), Ty Ronning (RW), Luc Smith (C), Joseph Snively (LW), Tyce Thompson (C), and Patrik Virta (C).